"I couldn't be happier with my decision to work with On Call Solutions. The people involved are wonderful! I used to get four times as many after hours calls as I do now. I am consistently earning additional revenue. And, I believe that I have gained some new clients." Will my clients pay for After Hours Assurance? 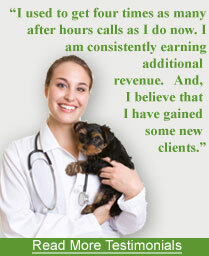 Yes,	our results have proven that pet owners are willing to pay for after hours advice from their primary care veterinarians. Even clients... Read More. Pet owners have spoken. We listened. Your clients are willing to pay for your after hours advice. Why aren't you providing this service? Give them what they want....and profit! When your clients believe they have an emergency after hours, they want to talk to you. When you provide after hours emergency consultation to your worried pet owners through On Call Solutions, you provide continuity of care and a superior level of service to your clients, you strengthen client loyalty, and generate revenue. Developed by a veterinarian for veterinarians. Click here to read related articles written by Dr. Brad Carmichael, DVM, clinic owner, founder & CEO of On Call Solutions, about his philosophies and insights of being an on call veterinarian, while maintaining a home-life balance.